While looking through the kitchen pantry for inspiration, I came across a bag of Wild Blend Rice made by Lundberg. I normally use this rice for a wonderful Chicken & Wild Rice Soup made in the Crockpot but I had bought too much and this bag was sitting there saying to me: “You have been lusting after Ian’s Rice breads for some time, so here I am!”. Who am I to argue with a bag of rice? Ha ha! 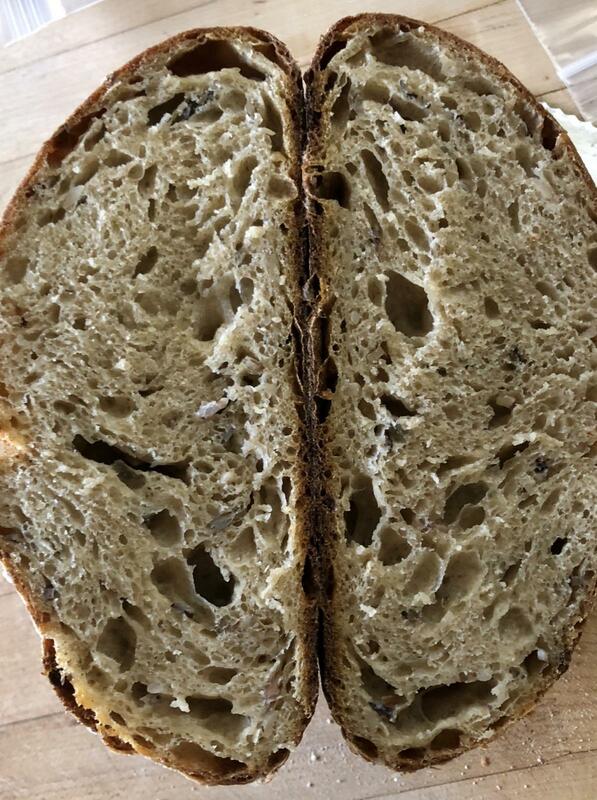 I have Peter Reinhart’s Artisan Breads Every Day and between Ian’s posts and this book, I managed to put this one together. Mill and sift the Kamut and Rye berries. Reserve 200 g of the sifted Kamut flour and 100 g of the sifted rye flour in a tub. Add the unbleached flour and the dried onion flakes to the tub. Cover and reserve. In separate containers, save the bran and leftover Kamut and Rye flour for the levain. Take 5 g of refrigerated starter and feed it 5 g water and 5 g of the bran. Mix well. This will be quite thick. Note: I use the bran for feedings first to soften it up and when all the bran is used up, I start feeding with the leftover flour. Cover and let sit overnight at room temp (73F). Feel the levain 15 g of water and 15 g of bran. Cover and let sit 12 hours at room temp. Cook the rice mix in plenty of water until the rice is tender. I just put it on a low boil uncovered. Drain, cool and reserve covered in the fridge until the next morning. Feed 30 g of water and 30 g of bran or leftover flour to the levain. Let sit covered overnight at room temp. By the way, because the mixture is so thick, there won’t be a lot of rising. There will be a lot of holes and it will smell mature in the morning. In the morning, prepare the final stage of the levain. Add 60 g of water and 60 g of leftover flour. Mix well and let sit at room temperature (73F) until it peaks; this took 4 hours. At the same time, take the rice out of the fridge to bring to room temperature. An hour or two before the levain is ready, add 585 g water to the bowl with the rice, stir to loosen, and pour it all into the tub with the flours. Add the honey and the buttermilk, and mix until all the flour is hydrated. Autolyse (let sit) for an hour or two. Once the autolyse is done, add the salt, 30 g water (dough felt stiff, hence the extra water), and 200 g of levain. Mix well and let rest for 30 minutes. Do three sets of French slaps and folds (75/40/10) at 30 minutes intervals. Again on 30 minute intervals and in a warm spot (oven with light on), do 3 sets of stretches and folds in the tub. Let rest an hour and a half and then retard the bulk for two or three hours. If you can see bubbles through the walls of the tub, the dough feels jiggly and there are some bubbles along the walls of the tub, you could go ahead and divide the dough at this point but I wanted to extend the bulk without it rising too much so I decided to refrigerate the dough for a few hours. The dough rose about 20%. Total bulk fermentation was 7.5 hours (4.5 hours on the counter and 3 in the fridge). Tip the dough out on a bare counter, sprinkle the top with flour and divide into portions of ~765g. Round out the portions into rounds with a dough scraper and let rest one hour on the counter. Do a final shape by flouring the rounds and flipping the rounds over on a lightly floured counter. Gently stretch the dough out into a circle. Pull and fold the third of the dough closest to you over the middle. Pull the right side and fold over the middle and do the same to the left. Fold the top end to the center patting out any cavities. Finally stretch the two top corners and fold over each other in the middle. Roll the bottom of the dough away from you until the seam is underneath the dough. Cup your hands around the dough and pull towards you, doing this on all sides of the dough to round it off. Finally spin the dough to make a nice right boule. 1 cup uncooked wild rice blend (NOT parboiled) I use Lundberg Wild Rice Blend. Rinse the rice under running water. Place the uncooked rice, chicken breast, onions, celery, carrots, garlic, bay leaves, chicken broth, water, Bovril and all the spices and seasonings (do not add the seasoning salt or pepper at this time) in a slow cooker. Cover and cook on the high setting for 3-4 hours or on the low setting for 7-8. In the last 1/2 hour of cooking, remove the chicken from the slow cooker. Allow to cool slightly before shredding using two forks. Add this creamy mixture to the slow cooker. Stir to combine. Add additional water or milk to your preference if the consistency is too thick. Season with seasoning salt and pepper to taste. Another beautiful set of six! This one must taste fantastic. Glad I could give you the push to use the rice and you know I'm a big fan of buttermilk for some added tang and moisture. Thanks for the soup recipe too as that looks like one worth trying for sure. I cut into it when it was barely cool so the crumb looks a bit gummy. Tasted great though! These are from a loaf that was cooled by at least 12 hours. What a great combination of ingredients to make another consistent bake. Bread and soup cannot be beaten together! Lovely as always Danni. Always impressed with the lovely combos you come up with. 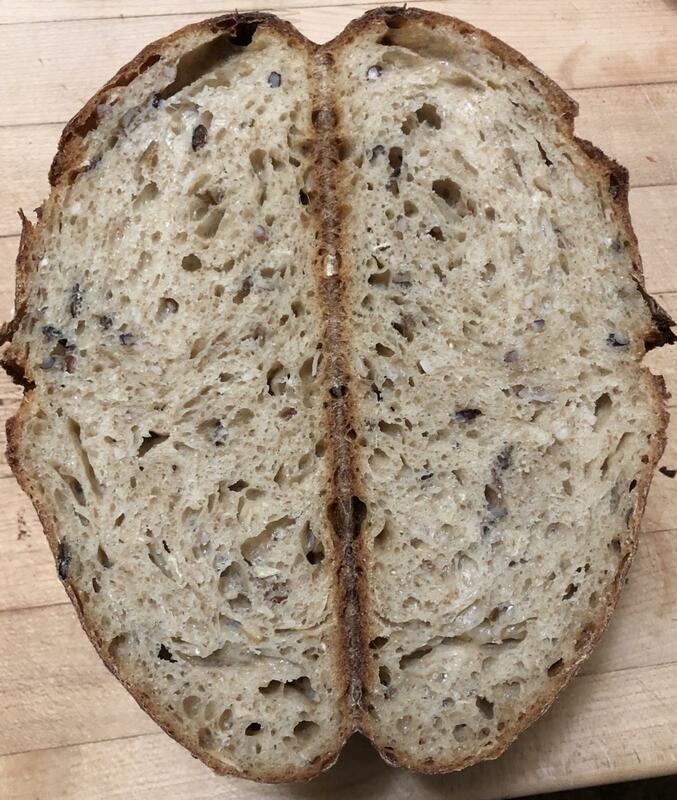 Whenever there are ingredients "looking back at you" they end up in a bread. Danni, you and I must both be tuned to the same "sourdough bread frequency". 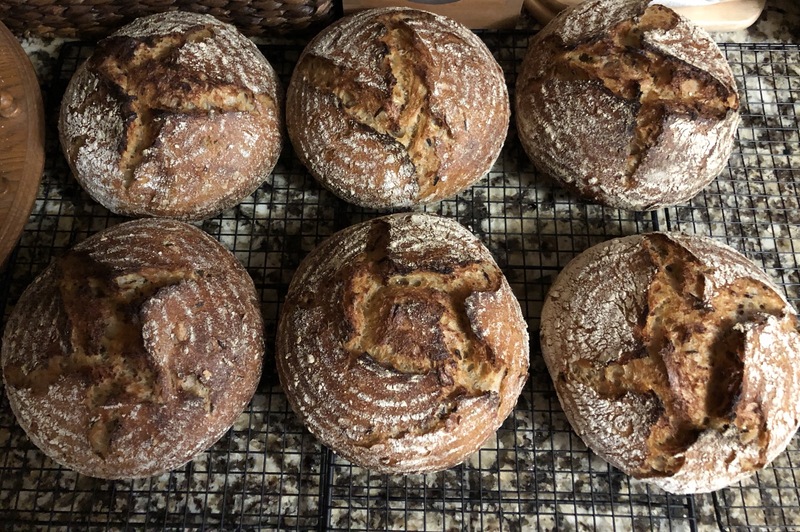 I have not posted for awhile and today thought I would have a look at what other TFLers have been up to and found your post for this beautiful Wild Blend Rice Sourdough with Onions....a very similar theme to the bread I just took out of the oven! 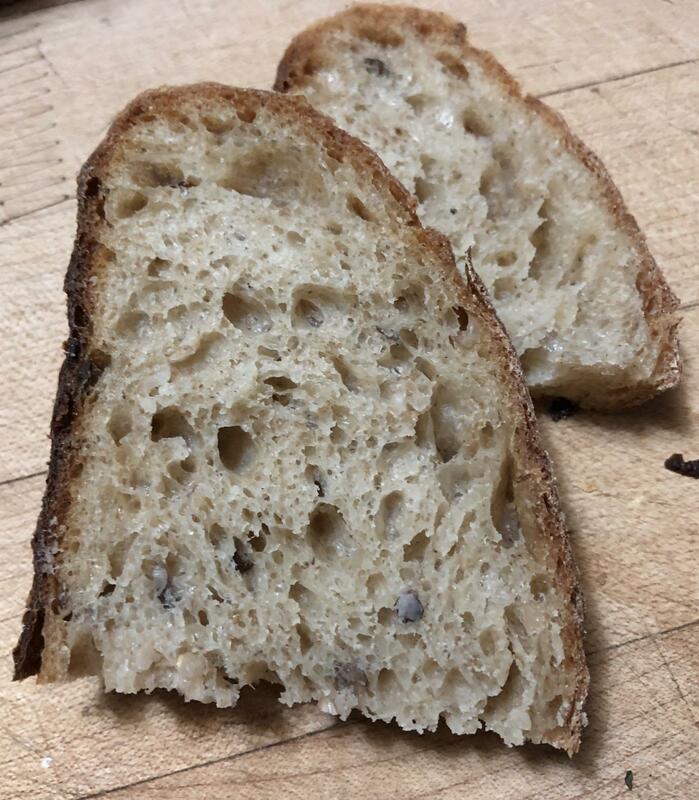 Your bread looks delicious, the crumb looks nice and chewy and light. Well done as always!